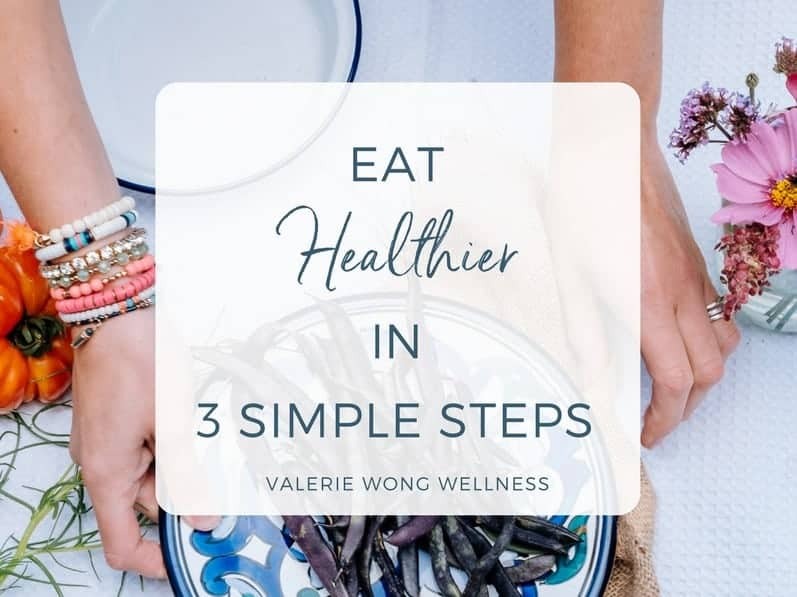 This week I’m sharing how to eat healthier in 3 simple steps — because healthy eating shouldn’t be so complicated! Following these steps can help you have more energy, maintain a healthy weight, or just feel better. And they’ll work for you whether you’re a vegetarian, meat-eater, or somewhere in between. 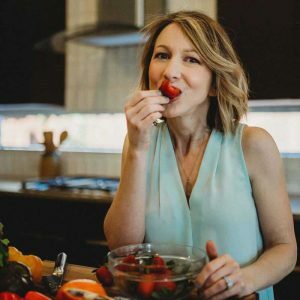 If one of your goals this year is to eat healthier, there’s a good chance you’re feeling confused and overwhelmed by all the conflicting information about what actually makes a healthy diet. This is probably what I get asked about most as a wellness coach. Should I eat Paleo or vegetarian? Low carb or low-fat? Grains or no grains? Are carbs evil? Lots of small meals throughout the day or only 3 meals? Here’s the thing . . . I don’t believe there’s one one way of eating that works for everyone all the time (a concept known as bio-individuality). So, I don’t promote one style of eating over the other or a particular “diet,” and I don’t follow a prescribed eating program myself. I also don’t believe in counting calories or carbs, eating low-fat, or dieting. Instead, I like to take a holistic and sustainable approach to healthy eating. And I like to keep it as simple as possible. So rather than a restrictive “diet” or a complicated system (because who has time for that?! 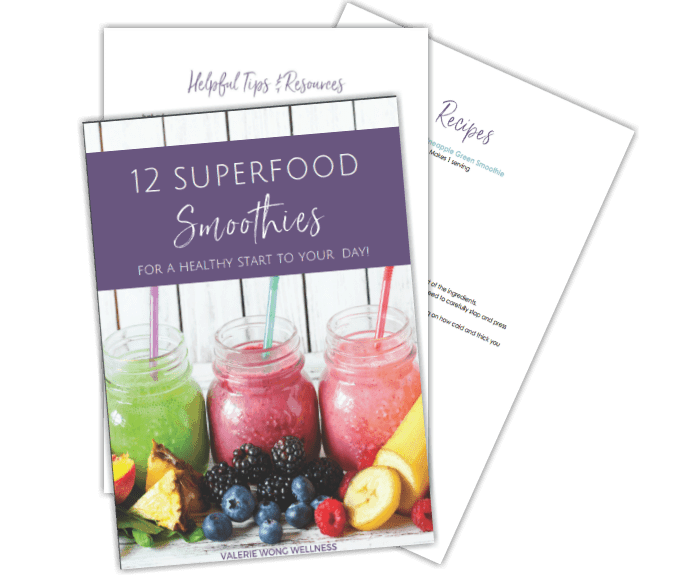 ), I’m giving you just 3 simple guidelines to follow that will have a big impact on the quality of your diet and your overall health. And they’ll work for you whether you’re a vegetarian, meat-eater, or somewhere in between. Healthy Eating Guideline 1: Eat real food. Another way of saying this is to eat whole foods, or foods that are as close to their natural state as possible. That would be processed “foods” — which are really just food-like substances (aka fake foods). These are things you find packaged in boxes and bags, like chips, crackers, baking mixes, pasta . . . to name just a few. They contain bad-for-you artificial ingredients that our bodies weren’t designed to consume or process. This also includes most fast food, because it’s been so heavily processed to be prepared quickly in a fast-food setting. Michael Pollan does an awesome job of explaining how to identify processed foods in his book, Food Rules: An eater’s manual, so I’ll borrow some of his rules here. Avoid food products that contain more than 5 ingredients. Avoid food products that are labeled “lite,” “low-fat,” or “nonfat.” Fats (the healthy kind — more on that later) are important for good health and maintaining a healthy weight. Food products with these labels are processed and usually contain a lot of sugar or other unhealthy ingredients that will sabotage your health. Avoid foods that are pretending to be something they’re not (or something manufactured as a substitute for a real food). He gives these great examples: margarine vs. butter, nonfat cream cheese (which doesn’t contain cream or cheese), soy-based mock meats, and artificial sweeteners. Eating real food gives your body the healthy fuel and energy it needs because it’s nutrient-dense, unlike processed foods that are just empty calories. Plus it’s giving your body the nutrients it needs to function like it should, and keeping your internal systems healthy — especially your hormones — is a huge factor in maintaining your energy, weight, and overall health. This is such a highly debated area that I thought it should get its own section. I’ll be honest — I don’t have a definitive answer on whether you should eat grains or dairy. You can find research-backed evidence that says grains and dairy are healthy, and just as much evidence saying they aren’t healthy. There are definitely some easily-identified reasons not to eat these — like if you suffer from Celiac disease or you’re lactose intolerant. Aside from that, I think you have to pay attention to your body and note how you feel after eating these foods. Do they make you feel better or worse? The key for these foods, if you choose to eat them, is to make sure you’re eating “real” grain and dairy products, and not processed versions of them. If you’re eating cheese, make sure it’s real cheese and not a cheese substitute like American cheese slices, products like Velveeta, or Cheez Whiz. As much as possible, eat grass-fed dairy products. These are harder to find and more expensive, but so much better for you (and for the cows from which they’re produced). By eating a diet of mostly grass, cows are eating the natural diet their bodies are designed for, and getting the healthy omega fats from the grasses that they then pass on to us through their milk. Don’t eat “low-fat” or “non-fat” versions of dairy products (that includes milk, yogurt, cheese, etc.). I know it sounds counterintuitive, but this is a more natural state because it requires processing to remove the fat from these products (and the fat helps slow the absorption of lactose, the naturally occurring sugar found in dairy). I personally eat only a small amount of dairy, like a little plain yogurt mixed into a curry dish, real butter, and good cheese on occasion. I make sure to buy grass-fed when I can find it, and I use the full-fat yogurt, I never eat low-fat cheese, and on the rare occasion that I drink milk, I drink whole milk, not skim or low-fat. Make sure you’re eating whole grains that are processed as little possible so that the fiber and nutrients remain intact. Most refined (processed) grain products are highly processed, have sugar added, and are just empty calories. Breads and pasta should be made with a whole grain as the first ingredient. Choose brown rice over white rice (white rice is so highly processed and stripped of its nutrients that I don’t even consider it a real food). Read the ingredients and follow those rules above from Michael Pollan when choosing grain products. Make most of the grains in your diet unprocessed grains like whole oats, brown rice, quinoa (there’s debate on whether to classify this as a grain or seed), millet, amaranth, farro, barley, and buckwheat. As for me, I do eat grains, but I try to limit the amount of bread I eat, since it’s a more highly processed food. I’ll have sprouted grain bread at home, quinoa, brown rice, and things like that. There are also so many grains (like millet, amaranth, and farro) that I haven’t experimented with yet, so I’m planning to explore more of those this year. Now on the weekends, I have no problem splurging with white bread or other grains products that aren’t really that good for me. Because sometimes a girl just wants some white bread. But that’s a treat and not something I make a regular part of my diet. Healthy Eating Guideline 2: Eat as little sugar as possible. If you have a sweet tooth like me, this one’s a real bummer. But sugar will zap your energy like nothing else, and it’s been linked to so many diseases. Cutting back on it is one of the most important changes you can make to your diet — and it’s the one rule that unequivocally applies to everyone. Now, I will never be one to tell you to give up desserts (because I love them myself and that’s just not happening). But we both need to limit the amount of sweet treats we’re eating and the overall amount of sugar we take in. Sweets — cookies, candy, cupcakes, pie (my personal fave), etc. You know what they are. But you might also be eating hidden sugars in foods you never would have suspected (some of them would even be considered health foods). If you’re following guideline #1, you’re already cutting a lot of sugar from your diet, especially hidden sugar in processed foods. Now that you know about these hidden sugars, you can cut out a lot of sugar just by reading labels. As for me, I like to reduce the sugar in my diet by cutting out foods that don’t really add joy to my palate (like hidden sugars in processed foods), and then enjoy my dessert or craft cocktail on date night. Good news — fat is not the enemy! Eating natural healthy fats is actually good for your body, your brain, and your looks. In fact, you need fat to thrive (but the right kinds of fats). Fats like trans-fats are definitely bad for you, and by avoiding processed foods you’ll automatically be cutting out A LOT of those unhealthy fats. But there are many natural sources of fat that are great for your body. Real butter (preferably grass-fed) — Kerrygold is a brand of grass-fed butter that is easy to find — I’ve seen it at Trader Joe’s, Whole Foods, Kroger, Costco, and even Wal-mart. Not good for cooking at higher temperatures. Extra virgin coconut oil — This is your best bet for cooking at high temperatures (just know that it can give a slight coconut flavor to your food). You can also add it to smoothies, oatmeal, and other foods. Ghee (preferably grass-fed) — Also known as clarified butter. This one is also good for cooking at higher temperatures, and I’ve read that even those who are lactose-intolerant can use ghee (but check with your healthcare provider to be sure). Extra virgin olive oil — Great for salad dressings and drizzling on foods. Not good for cooking at higher temperatures. Make the bulk of your diet REAL food, with an emphasis on vegetables, especially leafy greens. Eliminate (or greatly reduce) processed foods from your life. Cut as much sugar from your diet as you possibly can – sugar is evil! Add healthy fats to your diet — try to eat a healthy fat with every meal. These guidelines may be simple, but I know they’re not necessarily easy. If this is gonna be a huge change from your current diet, start with just one thing and focus on that. Once you have that one down, add another change. The end results will be so worth it. You’ll have more energy to tackle your goals, pursue your dreams, and have more fun in between. And you’ll find yourself feeling (and looking) better than ever. Change is hard, so be patient and kind to yourself in the process. You can do this! What’s the one thing from this list that you’ll incorporate first? Comment below and let me know!